Hi there! If you're like me, after the holidays, the crafting budget can be tight (especially after you've spent all your gift cards... ;) Today I'm hoping to inspire you to get creative and thrifty with your scrapbooking supplies. Would you believe me if I told you I made these Valentine's Day treat packages with an autumn/Thanksgiving paper collection? All the papers and accents you see here (except for the pearls) are from the Fall Bouquet collection, part of Club SEI's September 2014 Paper Crafting Kit. By punching out these pink and yellow patterned papers with a heart punch, they go from autumn-inspired to Valentine's Day-ready. Don't forget about the details when making your treats. 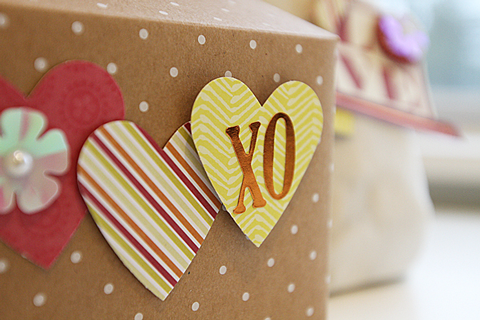 The copper "XO" is spelled out using the Fall Bouquet alphabet stickers, and I added a mini heart and arrow to the handle of the treat box. 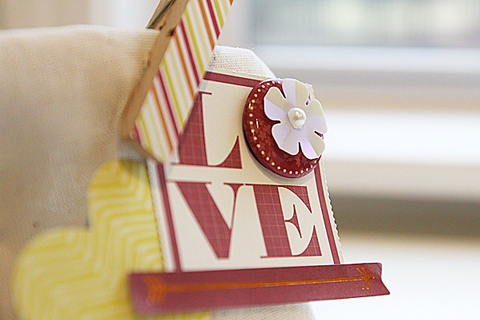 I adhered striped paper to dress up the plain clothespin, part of the Fall Bouquet sundries pack. 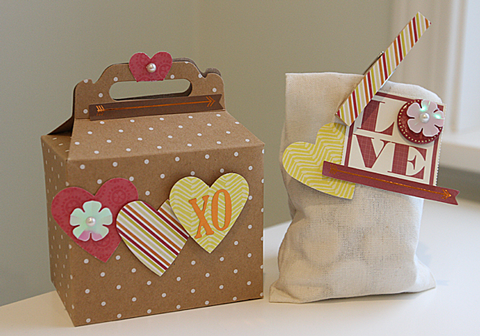 The polka-dot kraft treat box was a Target find and you can get muslin bags from most major craft stores. 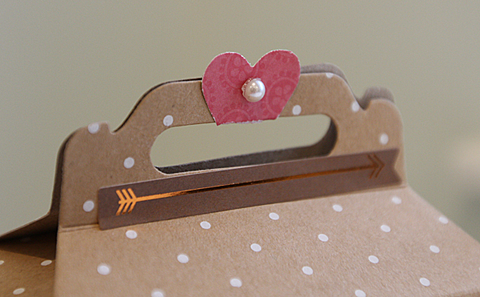 I encourage you to go through your supplies to find out-of-season patterns that will work well for Valentine's Day. Be sure to come back and share your projects in the comments below! Great ideas! Love them for any holiday!